SSID stands for Service Set Identifier. It is also known as the network name, and every wireless has one. Users must know or locate the SSID of a network in order to connect, usually in combination with a password. You can usually change the SSID using the settings for your router or other wireless access point. The network name cannot contain more than 32 characters, but otherwise there are very few limitations on what you can choose as your SSID. Technically speaking, the name of your network does not need to be unique, but it is highly practical to have an SSID that will stand out on the list of available networks–unless, of course, there are no other networks around. Usually, your router, extender, or other wireless access point is pre-configured with one or more SSIDs. If your neighbours have equipment from the same service provider and vendor, it’s easy to end up with a list of very similar-looking and sounding names. This can be both confusing and frustrating, especially for guests and others that are connecting for the first time. You are free to call your network whatever you want, so why leave it as an advertisement for the vendor? The most common reason to have more than one SSID on a single access point is using one SSID per frequency band. This may be pre-configured by your vendor or service provider. Typically, one SSID will contain the number 5, and the other name the number 2, pointing to the 5 GHz and 2.4 GHz frequency bands respectively. If your router/access point has band steering, you should only have a single SSID for both bands, so that the access point can pick the best band supported for each device and the user does not need to think about it. 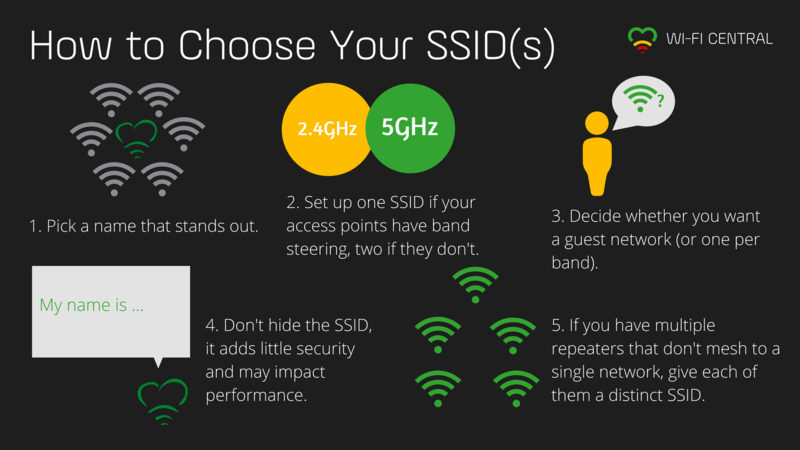 If you do not have band steering, you are better off with two SSIDs, but will need to keep in mind which devices support 5 GHz Wi-Fi and which don’t. Naming the SSIDs to indicate new versus old equipment rather than numbers or standards may make this easier to manage and remember. If you do not have band steering, but still go with a single SSID, you are essentially playing Wi-Fi roulette. Every device connecting will be making its own decision on which signal is the stronger and more appealing. In most cases this will be the 2.4 GHz signal even for devices that would have performed much better on the 5 GHz band. If you want to find out more about frequency bands and band steering, read Why Band Steering Means Better Wi-Fi. Band steering is becoming increasingly common in wireless access points. If you are in doubt about what is supported by your router, extender, or other access point, consult its documentation or contact your service provider if they supplied the equipment. Knowing what Wi-Fi technologies your computers, smartphones, and other devices support, is also a good idea. “Dual band” or “802.11 ac” in both routers/access points and wireless devices, means the 5 GHz frequency band is supported. If the latest standard mentioned is 802.11 n, it may have support for 5 GHz, but you may need to check the documentation more closely to find out. “Band steering” in your router or other wireless access point. Do you often have visitors that use their own devices on your wireless networks? For example your kids’ friends? Then having a separate guest network with its own SSID and password is a good idea. Guest networks should be configured on the same equipment as the main Wi-Fi network to avoid creating interference between the two. If you don’t have band steering, consider having two SSIDs for your guests as well. Note that having a large number of SSIDs on the same access point may negatively affect performance. Don’t overdo it and create multiple categories of users. The SSID itself is not a matter of security, but on your access point, you can configure the SSID to be visible or hidden. A hidden SSID means it will not be broadcasted, and will not show up when your average Wi-Fi capable device is searching for available networks. For simplicity, guest networks should always be visible, or you will likely end up spending an inordinate amount of time on helping your guests connect to the network. A Wi-Fi scanner will still be able to detect your network. Hiding your SSID may negatively affect performance, because more requests are required to connect. For performance reasons, we therefore recommend not hiding your SSID. If your home Wi-Fi is made up of a router and one or more repeaters or extenders, you are, in reality, dealing with multiple networks. You should carefully consider whether or not these networks are capable of sharing an SSID. When moving around with a wireless device such as a smartphone, it will usually tend to cling to the first access point it connected to, even when there is another one that is closer and would provide better coverage and performance. This phenomenon is known as a “sticky client”, which you can read more about in Sticky clients: Devices That Won’t Let Go Of A Bad Wi-Fi Connection. The most effective solution to the stickly client problem is client steering, a technology that ensures that multiple access points in a network work together to determine where devices should connect to get the best performance. If your equipment supports any sort of client steering, a single SSID is by far the easiest and the most practical. Pick a shared SSID and leave it up to each device to figure out where to connect. Some devices to a very good job with this by themselves. With others, you may have to restart Wi-Fi on the device to force a new scan and pick up a change in signal strength. Leaving each access point with its own SSID, is definitely cumbersome, but does make it easier to see where you are connected and to manually change where you connect. In this case, we strongly recommend naming access points after their locations for ease of use, rather than having to remember (and explain to visitors) which goes where.